(From left) Corey Kispert, Rui Hachimura, Josh Perkins. Conditions are perfect for a great season of college basketball in Spokane. Expectations are always high for Gonzaga basketball. This once-upon-a-time Cinderella story has been, for a while now, more Goliath than David. And the national perception has finally caught up to that reality. The Gonzaga Bulldogs enter the season ranked No. 3 in the Associated Press Top 25. In 2005, when Adam Morrison and his moustache dominated college basketball, the Zags entered the season ranked eighth, their previous best until now. Two years ago, when Przemek Karnowski, Nigel Williams-Goss and company ran off 29 straight wins and danced all the way to the National Championship game, the Zags began the season ranked 14th. So, in a way, despite all the great Gonzaga teams that have come before, expectations for this bunch are higher than ever. But why? The answer is equal parts task at hand and the team that is set to take it on. As usual, Mark Few and his coaching staff have built an absolutely brutal nonconference schedule. This year's could well be the toughest, and it's certainly the most star-studded. Over the course of 10 days, the Zags will face off against three teams also ranked in the preseason Top 25. A revitalized Washington Huskies squad, ranked 25th, will visit the Kennel on Dec. 5. Then, it's down to Phoenix for a game against the sixth-ranked Tennessee Volunteers on Dec. 9. From there, a trip to Chapel Hill, North Carolina, for a rematch of the 2017 National Championship game against the eighth-ranked Tar Heels. Oh yeah, and before that three-game run the Zags will take part in the Maui Invitational. Long considered the premier early-season tournament in college basketball, this year's field is as strong as ever. Depending on how the bracket breaks, Gonzaga could face off against either No. 4 Duke or No. 11 Auburn in the days before Thanksgiving. Once conference play rolls around, though, things should get a lot easier. Saint Mary's, Gonzaga's archrival, is going through a rebuilding year. The Gaels won their game in Spokane last season, but lost that team's three best players to graduation. This season it looks to be the BYU Cougars who will pose the greatest threat to the Zags. Junior forward Yoeli Childs has a legitimate shot at being named the league's most outstanding player. He's surrounded by an experienced and talented supporting cast which now includes former Gonzaga guard Jesse Wade. NCAA transfer rules require Wade to sit out this season, so he won't be on the floor when the Zags and Cougars face off. But after a year in Spokane, he surely has some inside information on Gonzaga and its players. And the players are the biggest reason for all the buzz around the Bulldogs. Gonzaga lost two starters from last season's team, Silas Melson and Johnathan Williams. But that's about it as far as roster turnover goes, and Gonzaga is ready to replace them with its usual mix of talented transfers and highly touted international recruits. Before getting to the newcomers, though, let's take a look at the familiar faces. Fifth-year senior point guard Josh Perkins has slowly put together one of the more impressive careers in Gonzaga history. His experience — he's the lone remaining starter from the 2017 championship game — and veteran leadership will be critical. Joining Perkins in the backcourt are sophomores Zach Norvell Jr., who blew up in the NCAA Tournament last season by hitting big shot after big shot, and Washington native Corey Kispert. Both players stepped in and made immediate impacts as freshmen last season with great shooting and above-average rebounding abilities from the guard spot. The biggest names, however, belong to the big men. Junior forwards Killian Tillie and Rui Hachimura burst onto the scene last season and look poised to make another jump this time around. Tillie, who will miss the first eight weeks of the season with a stress fracture in his ankle, has been the more consistent player over his first two years in Spokane. The 6-foot-10 Frenchman played meaningful minutes as a freshman before becoming a full-time starter as a sophomore. But it's Hachimura, the reigning Inlander Readers Poll Athlete of the Year, who is garnering the most hype. The 6-foot-8 junior from Japan spent last season coming off the bench, but he provided as much of an impact as any of the starters. When he arrived on campus in 2016, his raw talent had yet to be refined, a process hindered by the fact that he was still learning the English language. Now fluent, Hachimura's game has blossomed to the point of being a projected first-round pick in next year's NBA draft. As good as the returning players are, they alone don't account for Gonzaga's position near the top of the preseason polls. 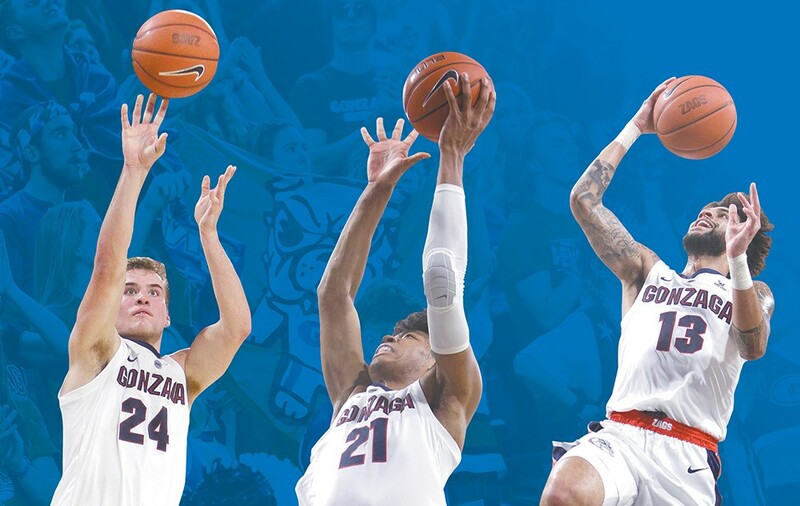 Three new faces have helped elevate Gonzaga to the No. 3 spot in the Top 25. San Jose State transfer Brandon Clarke averaged 17.3 points and 8.7 rebounds per game in his last season with the Spartans. Clarke looks and plays very much like the Zags' last power forward, Johnathan Williams, who also put up big numbers at a lesser program before transferring to Gonzaga. Geno Crandall, the newest face on the roster, has made the switch from foe to friend. Last season, his North Dakota Fighting Hawks nearly pulled off an upset of the Zags in the Kennel. Crandall scored 28 points in that game. And then there's Filip Petrusev, the latest in the long line of talented international big men to make their way to Spokane. The freshman from Serbia wasn't even alive when Gonzaga shocked the basketball world with a run to the Elite Eight in 1999. Next up: Gonzaga hosts Texas Southern on Saturday at 7 pm. The original print version of this article was headlined "Great Expectations, Again"